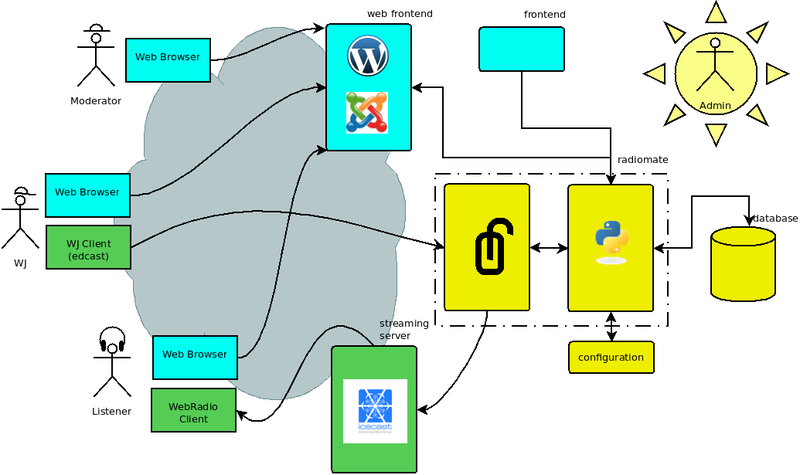 With the RadioMate project we are building a new free software platform for distributed webradios, i.e. webradios in which the WJs can transmit wherever they are (from home, from the site of an event, …). 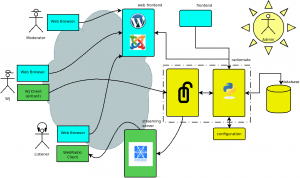 The project is a Freifunk–Ninux.org proposal, and is sponsored by the Google Summer of Code program. The first webradio that will use the new platform will be Fusoradio, that is an active and distributed webradio headquartered in Rome (at Fusolab), but that currently uses closed-source solutions. Thus the project will not end with the GSOC sponsoring, but will continue growing thanks to the contributions of people that will be actively using RadioMate. For what concerns the current status of the work, the design of the architecture, of the API and of the database schema have been done, and the code that accesses the database has been completed. I have also studied the liquidsoap language and found a solution to use it in a decentralized fashion, performing some tests. What is missing, and will be done before the deadline (I am currently working on the project full time) will be to complete the JSON interface, implement the scheduling of the webradio transmissions, and of course, write documentation. This entry was posted on Friday, July 30th, 2010 at 1:56 pm	and is filed under Google Summer of Code, Uncategorized. You can follow any responses to this entry through the RSS 2.0 feed. You can leave a response, or trackback from your own site.